It’s been a busy weekend at Keith SC HQ, good reason for the delay in getting our latest blog post online. As I sit here trying to recall all that’s gone on since Saturday’s game, I’m finding that it all rolls into one. All except one point…. that moment when Max played a precision ball through the Rothes defence, perfect for in-form Cammy’s run. All of us in KSC corner knew what was coming as we anxiously looked to the linesman who kept his flag down, and when Sir Keith is handed an opportunity like that to win the game he needs little encouragement. Needless to say a little shimmy to get past Mini in the Rothes goal, and the rest was history… the KSC cauldron of noise erupted, in scenes not witnessed since Cammy slayed Buckie in a similar fashion in the cup last year. The winning goal in the closing minutes of the game was no less than the Maroons deserved given the grit, determination and flair that they had shown. 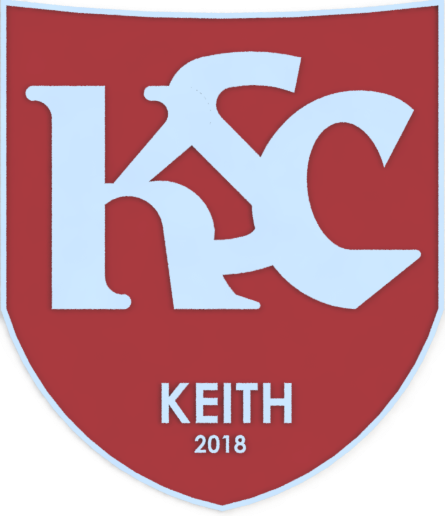 After an even first half, where Keith found themselves disappointed to be 1-0 down to a late Iain Maclellan strike, the boys came out in the second half with a new-found swagger, not evident at Kynoch Park for a long time. Despite the threadbare nature of the squad, the lads did not shy away from playing the new style of football that they’ve been working on for the last few weeks. Each and every man in a Maroon shirt was playing as one against the Speysiders, and that team spirit was repaid when Cammy fumbled the ball over the line to bring the sides level. The makeshift central defence pairing of Spink and Manson was odd enough, as Spink moved infield from his usual full back position. McAllister’s swapping of attack for defence was a move which showcased the striker’s adaptability to slot into the position seamlessly, displaying a level of professionalism in helping out, with no questions asked. It was a truly superb performance by the team, which whets the appetite of Maroons fans ahead of Saturday’s trip down the Enzie Braes to Victoria Park. If we can put in a performance like that, we can compete with the best of them, and if we can add a couple more experienced heads through the spine of the team, then a top half finish should be the target this season. The result set us up nicely for a superb Keith Show weekend. Negotiations went on after the game with Cammy, Lennox and Mugsie about an all-star appearance at the KSC stall on Sunday for the keepy-up competition, but the event had come around too soon with not enough notice. Nevertheless, both Cammy and Deano made a commitment to the Supporters Club that there will be an increased presence from players at future events. It’s agreed that for too long there has been no socialising between the support and the players, but an invite from the club for members to join the team in their post-match hospitality was duly accepted, and was an excellent opportunity for us to mix. The grit and determination of the players to succeed was evident, a new confidence which can be attributed to the recent improved performances on the pitch. The Keith Show stall got off to a flyer early on Sunday when local lad Riley Simpson turned up to show off his keepy-up skills, instantly re-writing the early leader board to position himself firmly at the top, with a score of over 330! When asked if he would like to use up his second and third shot we were coolly advised, “Nah I think I’ll be fine”. The Ross County youth superstar wandered off leaving the crowd flabbergasted by his efforts. A huge well done to Riley, who doubtless has a wonderful career ahead of him. The stall saw many faces come and go, some keen to show off their football skills, some keen to share a drink, and even local celebrities MSP Richard Lochhead and Moray MP and linesman Dougie Ross stopped by. It’s safe to say that Doug is just good at keepy-ups as he is at running the line – but please don’t hold this comment against us if you have one of our matches again. The weekend saw us multiply our memberships significantly with us growing our numbers from 37 to 83 – a wonderful effort from all involved.